One of the true perks of being a New Englander is that I really get to experience fall. Fall colors. Fall flavors. Fall air. It is my favorite season by far. It reminds me of college in Massachusetts where the crispy leaves would crunch under my feet and the cold air at the beginning of the school year would give me that fresh start sort of feeling. Mostly it conjures up memories of apple picking and warm apple crisps that would be made from the bags of apples we brought home after a fun weekend out. Locally we are a bit spoiled with numerous apple orchards and even cider mills where you can get a cup of cider and warm sugary cider donuts. We have our favorite spots but this year also wanted to try making our own cider donuts at home. The last time we made donuts at home they were so good that we were a bit giddy that we actually did it. For those we used baking powder and the donuts took on a cake like texture. They were dense and so yummy and lasted about an hour. 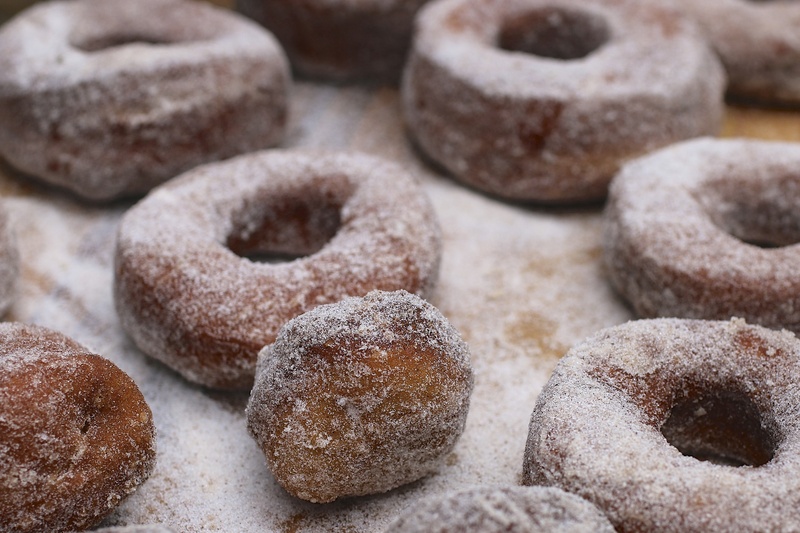 For these cider donuts we decided to use yeast- which made the donuts far more airy. Cider donuts are usually cake like so this was a bit of an experiment for us and one that turned out better than we hoped. We used a very basic donut recipe but altered it by allowing the dough to rise, get cut with cutters and then sit overnight in the fridge. We then brought it out to allow it to get to room temperature before frying the donuts off in vegetable oil on our induction burner. We do this outside to avoid that fried food smell in the house. Add sugar, butter, olive oil and vanilla bean paste to the warm cider and stir until dissolved. Into that mixture add the yeast and let stand for at least ten minutes in a warm place. Mix all dry ingredients together and pour over warm cider yeast mix. Work the dough for a few minutes until it becomes elastic and all ingredients have combined. Place in a bowl and cover with plastic wrap and let it stand until it doubles in size. Roll out on a floured surface and cut into circular shapes then punch out centers with round cutter. Place on a tray – cover with plastic wrap and leave in fridge overnight. Remove from fridge and place in warm place until doubled in size. Fry at 345 f. until golden brown on each side. Remove and toss in paper bag filled with sugar and cinnamon. You will be left with gorgeous sugary donuts with a cinnamon flavor that screams fall. These are best eaten immediately while still a little warm. This recipe made about 12 donuts with a few holes to spare. They were light and airy and super moist inside. How, might you ask, do I know this since I am trying so hard to eat gluten, sugar and dairy free? I caved. I cheated. I blew it. But it was totally worth it for the few bites I took. I can only hope that my children will add the experience of making cider donuts at home to their ever growing list of fall associated memories. Do you have a favorite donut recipe you could share with us? We’d love to experiment with a few more. Five Spiced Salted Pecans…for Ice Cream!